Celebrate SPES’ Birthday on Earth Day! Featured » Celebrate SPES’ Birthday on Earth Day! Help us celebrate the earth and our 30th birthday at a SPES Earth Day celebration in Stanley Park! Enjoy some sweet treats (yes, we’ll have birthday cake and our famous earth cookies), free naturalist-led walks and activities, or get your hands dirty to keep our Park looking sharp. Stop by the Stanley Park Nature House on Saturday, April 21 between 12:00pm to 4:00pm where the fun will begin. 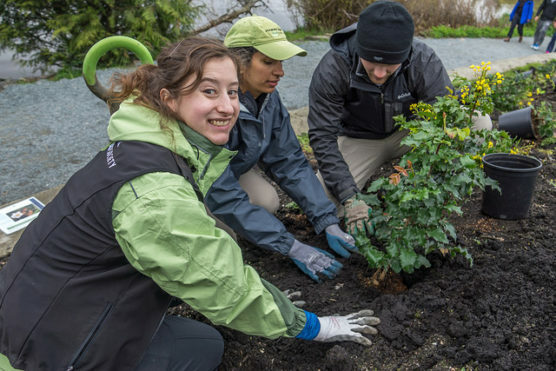 Embrace your inner environmentalist at an invasive species plant pull or help us get some native plants in the ground. Prefer to enjoy the sights and sounds of the Park? Join us on a free walk to explore the Pacific great blue heron colony or get a glimpse of our conservation efforts up close on a walk featuring the challenges and successes of restoration in urban parks. Wander among our exhibitor tables for family-friendly activities from our sponsors and community groups. Festivities kick off at the Nature House viewing platform at 12:00pm, tools and treats provided!